Jake Fromer and Jeff Heil sit across from me at the work table in the center of their design studio in Northwest Portland. Between us sits 17 wallets, a mounted drill press, a litany of hand tools, and three inches of freshly cut leather. The 800 pound laser cutter in the corner balances out the room. This is a craftsmen’s workshop and these boys look completely at home. Jake and Jeff are the founders of WOOLLY, a Portland-based wallet manufacturing company that is bending the norms of tradition and innovation to make an age-old product meet the needs of today’s consumers. When it comes to handmade leather goods, traditional craftsmanship connotes values of durability, care and one-of-a-kindness. However, the traditional user experience often requires dealing with realities of bulkiness, irregularities and compromise. WOOLLY wants to preserve all the invaluable characteristics of handmade tradition while using modern technology to literally laser cut out the rest. WOOLLY is preserving all the invaluable characteristics of handmade tradition while using modern technology to literally laser cut out the rest. To do this, WOOLLY starts with quality: durable yet thin vegetable-tanned leather, paired with strong yet finely spun thread. Their patterns are digitally designed, the leather is laser cut, and the seams are hand stitched. 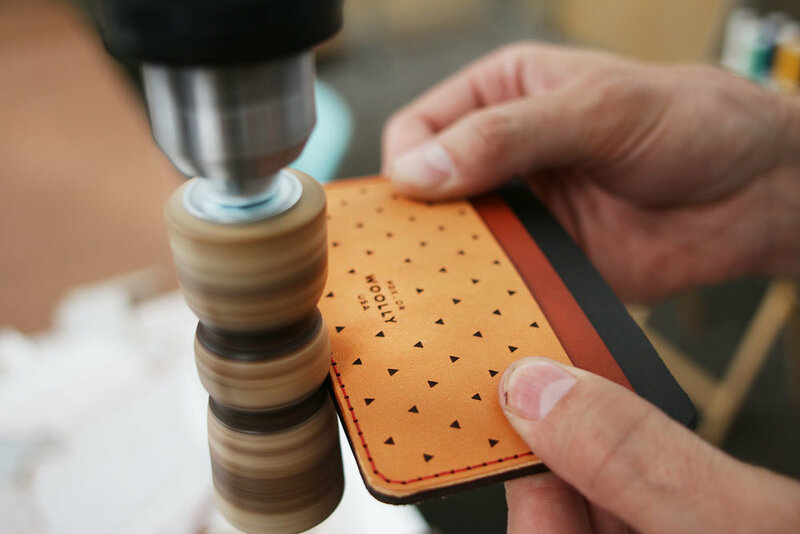 Throughout, the process is very thoughtful — a quality shown in each wallet produced. The lesson here is to distill exactly what “traditional” means to your industry. Tools and methods were means to a traditional end. People wanted a wallet that worked and looked good. That is still the case today; however, the consumer has evolved, so the tradition must evolve along with it. For me, an outsider surrounded by the machinery and materials that goes into making just one wallet, and hearing from the minds behind the brand, I’m sold. The question that WOOLLY, and hand makers like them, need to answer is how do you package that feeling and share it with those who don’t get to experience your story first hand? Most companies are not able to have their consumers come traipse through their studios. And even if they could, the effort might be effective, but it’s not scalable. At the start, some of the most well-developed companies find themselves struggling to effectively market themselves. Tons of time and energy have already been spent disrupting an industry, innovating processes and reimagining age-old products. And now you’re supposed to translate that disruption onto mainstream media? All of a sudden your masterpiece becomes something derivative, captured with just another photo on Instagram. WOOLLY came to this conclusion early on after a couple of false starts. A series of Facebook ads and a bout of influencer marketing checked all the right boxes, but the results from the campaigns didn’t offset the time and money invested. And cost is just part of what is at stake. Young brands are fragile. At this stage, every marketing tactic has a disproportionate effect on how people view you. These initial forays into branding sobered Jake and Jeff on their overall marketing strategy. Going forward, the same care that went into their products, would also be given to their brand image. How does a handmade brand share their message with those outside the sound of their voice? For WOOLLY, they are tackling this issue by embedding brand amplification moments into every aspect of their process, product and purchase. Their major step into this business model is through WOOLLYLAB — a digital customizer for customers to design their own wallets. With the help of a successful Kickstarter campaign, WOOLLYLAB allows customers to choose their wallet’s color, layering, pattern, stitching, etc. With the help of a successful kickstarter campaign, WOOLLYLAB allows customers to choose their wallet’s color, layering, pattern, stitching, etc. The digital marketing experience is often very ephemeral and takes more than words and pretty pictures to tether someone to your brand. Now, with WOOLLYLAB, customers have not only a product to latch onto, but also an experience. Even before purchasing, this experience is shareable — it creates an anchor point between brand and potential consumer. With WOOLLYLAB, for a brief moment, each customer is allowed to clock in at WOOLLY, design their own wallet and then press a button to have it custom made. They are no longer buying from WOOLLY, but working with WOOLLY to make something unique. People love the idea of possibility — the possibility of unique experience, unique ownership, and a unique story to tell. By giving their customers the gift of possibility (there are literally millions of possible designs in the WOOLLYLAB customizer), WOOLLY is becoming part of their customers’ story rather than the other way around. For a company started by a pair of young guys, it is surprising how intentional they have been about being consumer and product first, and promotion second. Other companies often build their minimum viable product and then shift efforts completely to exposure. “Minimum,” however, is currently not a part of the WOOLLY brand vocabulary. Their brand story will not be written in the writer’s room and crafted to capture attention. Instead their story is a documentation of real processes and amplified by customers who choose to carry the torch. “Traditional” no longer defines just their craftsmanship, but it also describes how the company is jumping clear-eyed into building its brand. To that end, WOOLLY has doubled down on the core concept of their brand — tradition meets innovation. “Traditional” no longer defines just their craftsmanship, but it also describes how the company is jumping clear-eyed into building its brand. Everything is methodical, measured and precise. With unique perspective on the value of tradition, WOOLLY is effectively changing wallets, the wallet buying experience, and wallet ownership. Check them out here to see what your modern tradition can look like.